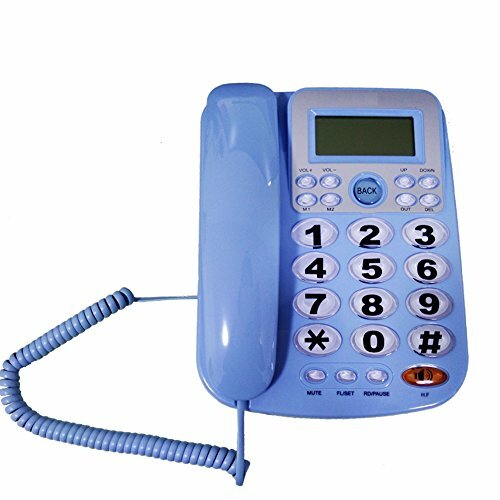 This landline phone features large keypad buttons for ease of dialing and features clarity power technology to make conversations not only louder, but also clearer and easier to understand, perfect for low vision aids and hearing impaired people. It can store up to 2 one-touch speed dial memories for rapid dialing most important or most used phone numbers. The base speakerphone, handset and ringer have volume control(3 levels). The speakerphone/redial/alarm/LCD screen/LED flashlight increase user friendliness. This elderly corded phone is powered by the phone line, it will work after the phone connect with your wall jack by the straight phone line(comes with the phone), no need any batteries or DC power. It still works when there is a power failure at your home. Amazon logistics*Best customer service*30 days money back guarantee*1 year warranty*buy with confidence! If you have any questions about this product by HePesTer, contact us by completing and submitting the form below. If you are looking for a specif part number, please include it with your message.